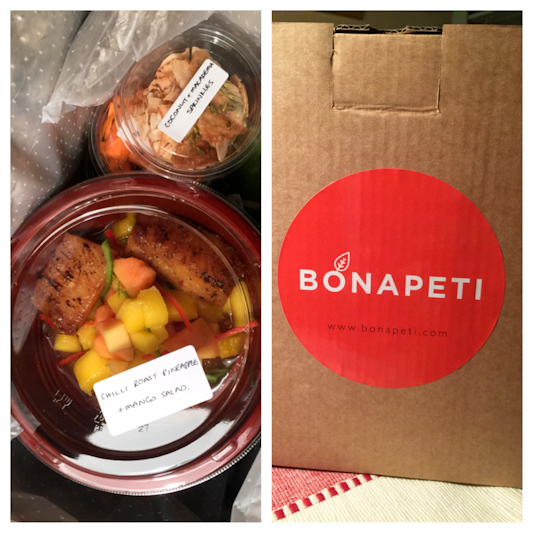 Spotlight on: Bonapeti – Freshly prepared and healthy food delivered to your door! 2015 Update: Bonapeti is now live, so you can all try out their tasty and healthy, freshly prepared meals! Rather excitingly, they’ve vastly extended their delivery area which now stretches down as far as Wimbledon to Vauxhall south of the river and Cricklewood to Kentish Town north of it. Better still, they’ve introduced a special code for 40% off first orders (plus free delivery) – simply use the code BON201502. Check out www.bonapeti.com, and happy ordering! 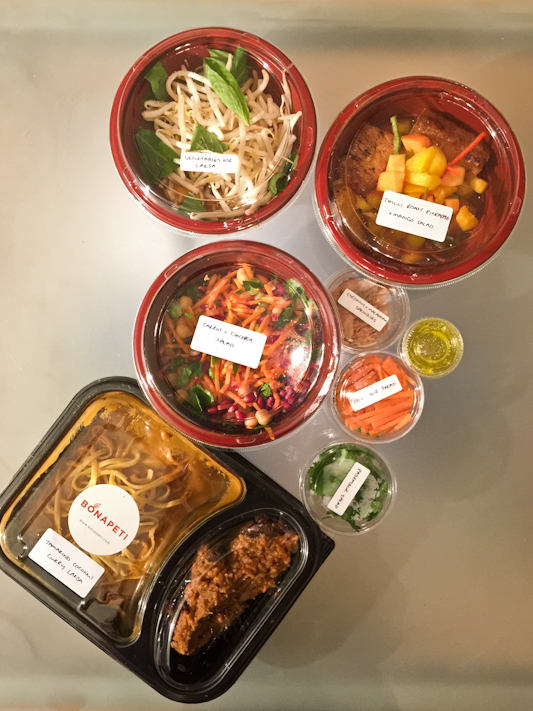 I had the pleasure of trying out the Bonapeti food delivery service a few days ago, being treated to a full three-course meal of their freshly prepared and healthy food. Bonapeti’s meals arrive in a smart chill box emblazoned with their logo – and opening it up as rather exciting as you see the delights of food that you’ll be eating that day. The box is well insulated, and everything arrives neatly packed so there’s no fear of your food being harmed in any way, even if it is left for you for a few hours before you come home. L: Opening the Bonapeti chill box R: Delivery’s here! Placed on top of the box I received were three cards detailing and explaining what I’d be eating – as well as instructions on how to construct each course, and the all important ingredients, allergy and nutritional information. I say ‘construct’ – if anyone’s now thinking “hang on, this is a delivery service…why am I having to cook my own meal? !” it’s nothing remotely taxing in the slightest! As meals arrive cold (so, again, they can be stored for a few hours before eating) most mains simply require a few minutes warming in the microwave, or oven if you so prefer. Side dishes and desserts simply require assembling; such as mixing in some salad dressing (no soggy salads sitting around for hours!) and topping fruit with crunchy nuts. Seriously, it took me barely minutes to get everything prepared…plus a little longer for me personally as it seemed a shame not to present it nicely! Bonapeti’s website does suggest that their items could also easily be used to cook up your own delicacies if you so wished, which I think is a great idea – a really easy way of obtaining healthy, delicious and perhaps slightly unusual ingredients that can be readily adapted as you like. I tried the carrot salad with pumpkin seed Dukkah; the coconut tamarind curry Laksa with marinated tofu Pasembur (essentially tofu fritters); and the chilli marinated roasted pineapple, toasted coconut, mango and papaya salad. Now, although I’m not a vegetarian I do indeed love vegetarian meals. Bonapeti’s meals had nothing missing for me, personally, because of an absence of meat – and I was (honestly) rather stuffed towards the end of dinner, not even being able to finish my dessert. 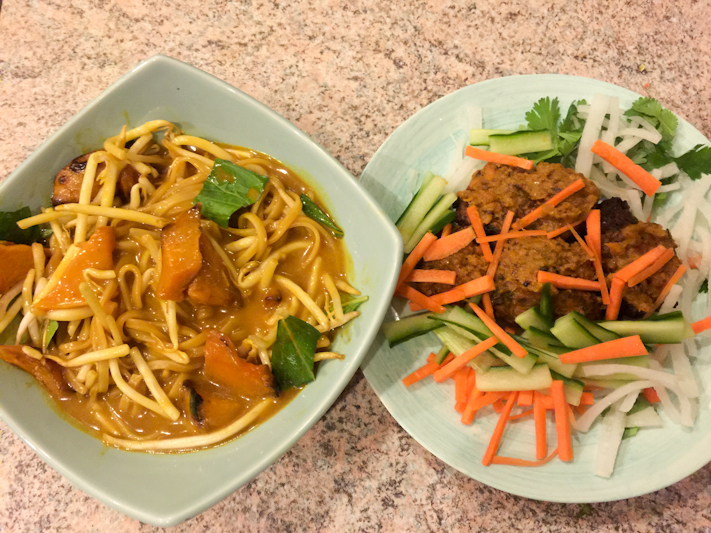 However, I can easily see how easy it would have been to add in some meat or fish – perhaps prawns to Laksa, or chicken pieces to accompany the fritters – to further extend the meal. The Laksa (I love a good laksa!) was mild with intriguing flavours and worked well with tender chunks of roasted squash. The accompanying tofu fritters came in a great spicy peanut and sweet potato sauce and were practically melt-in-the-mouth gorgeous; the bed of veggies (carrots, cucumbers) that came with them were a great crunchy contrast. 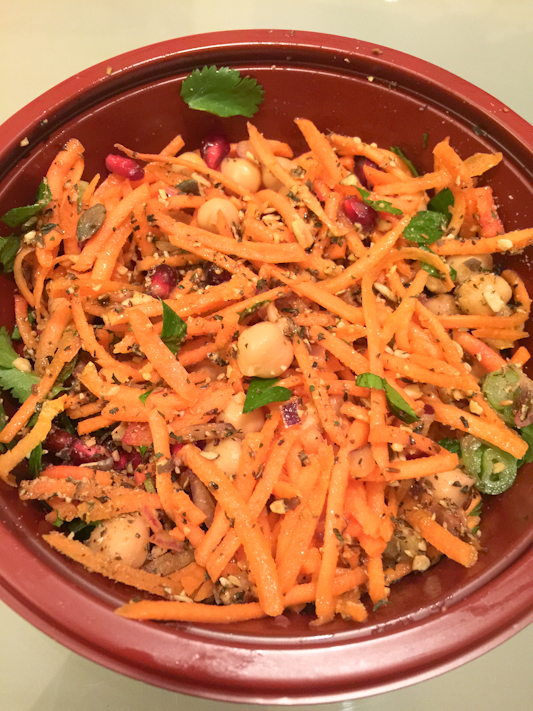 I personally ate the carrot salad as a starter – the shredded carrot was well complimented with chickpeas and pomegranate; covered with the Dukkah spice mix and tossed with a lemon dressing, the salad overall was an interesting, light yet gorgeous mix of tastes and textures. The pineapple, mango and papaya fruit salad was the perfect end to the meal – another dish of fascinating flavours (chilli!) that really set the tastebuds alive! 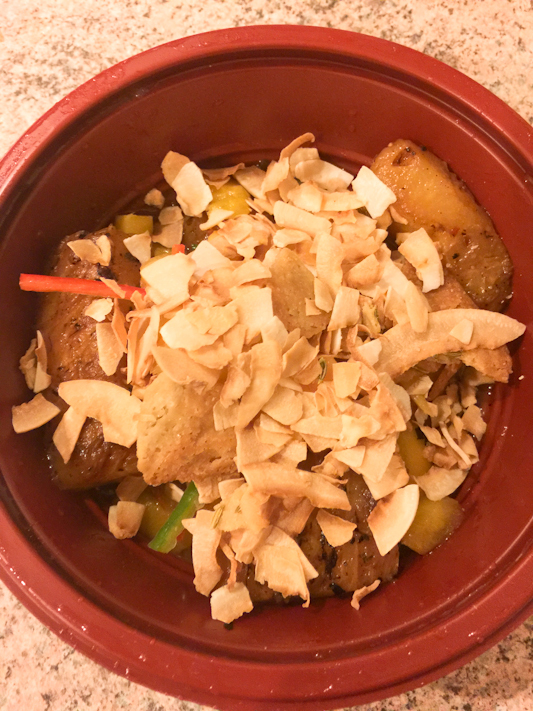 Pineapple, toasted coconut, mango and papaya salad – with plenty of crispy macadamia nuts as a toppping! As mentioned, this was indeed a very filling three-course meal. Although the starter/side dish and dessert perhaps sound on the light side, they are anything but – and the main (the Laksa with a side of tofu Pasembur) was a very generous portion indeed. Bonapeti are launching in January 2015, and will be offering their delivery service to select postcodes in West London. More on Bonapeti and the team behind the company can be found at www.bonapeti.com, where you can also see a preview of the dishes they will be offering. And do also keep up to date with all their latest news from Bonapeti on Twitter and Facebook!